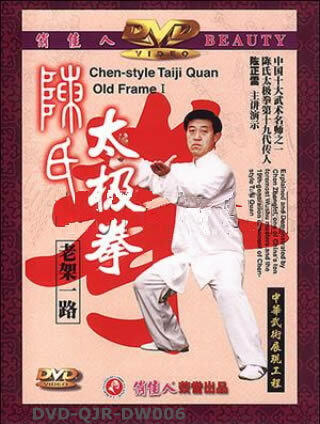 Chen-style Taiji Quan Old Frame (Lao Jia) emphasizes softness with hardness hiding in. While practicing, you carry yourself with poise and confidence, keeping your footsteps light and steady, with your body upright and natural and your vital energy flowing all over. The main movements include ward off, deflect, push and press with trample, jackknife, elbow and lean as subsidiary. You should move smoothly and apply your force explosively. Exercise Requirements: Let your body lead your hands and rotate in circle with your waist as axis. Make every movement, feint or real to the full. Throughout the play, you should keep your vital energy flowing continuously. This is an excellent and very popular double DVD. It shows the whole form in an unbroken sequence and explains the principles. Then Master Chen demonstrates the form move-by-move and also he shows applications. At the end he teaches a short form consisting of a mere 18 essential moves.